Yesterday's big move was the euro which rallied substantially. In fact, 'substantially' probably isn't a strong enough word to describe the move to the upside as the EUR/USD pair put on over two cents to take it from $1.3040 to $1.3260. ECB President Mario Draghi looked rather confident that the Eurozone economy should recover, boosting currency investors' confidence in the euro. At the same time, Spain had a successful debt auction, with the first one for the year selling more than the target. As a result, the strongest gains since early August last year ensued and this morning the rate is at $1.3270. Central bank decisions will be the focus of the day, with the first BoE and ECB rate decisions of 2013. Unfortunately, it's unlikely that there will be any change from either party so forex spread trading investors will be focusing on their words rather than their actions. The euro lost 17 points against the dollar yesterday, closing at $1.3062, as the ECB are set to announce the results of its monthly policy meeting later today. As mentioned, President Mario Draghi is expected to leave the benchmark interest rate unchanged at 0.75%, although there has been some speculation that lower rates are gaining bias. Undoubtedly, the press conference will confirm or discard that. Yesterday's economic results in Germany were worse-than-expected, sending the euro/dollar forex pair 34 points lower to $1.3079. Europe's largest economy has seen its factory orders dropping due to weaker demand from outside the Eurozone, with trade balance also below expectations. In addition, German Chancellor Angela Merkel acknowledged on New Year's Eve that 2013 could be more challenging than 2012. 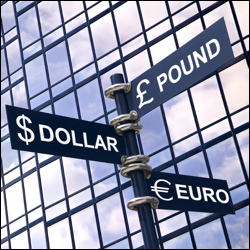 The shared currency posted another rise yesterday, recouping 40 points to $1.3113, as CFD trading investors await the European Central Bank meeting later this week. Last year's expectations that Greece might leave the Eurozone and that Spain or Italy could get into real trouble did not materialise and this gave participants fresh hope for better days ahead. This morning, EUR/USD is at $1.3122 and near-term support and resistance are seen at $1.3065/30/00 and $1.3170/3215/55 respectively. After a two day decline, signs that the US economy is recovering, albeit at a slow pace, encouraged a risk-on mood from forex investors. In addition, rising business confidence in Germany, Europe's biggest economy, also helped to overturn the previously bearish sentiment. Consequently, the EUR/USD pair posted a slight rebound of 27 points to $1.3080, but this morning the bears are driving the single currency back towards the $1.3000 level as the pair trades at $1.3020. The EUR/USD pair dropped 132 points yesterday to $1.3053 as US lawmakers continued debating about the nation's debt limit. Concerned that an agreement is nowhere in sight, spread trading investors rushed back into the safety of the dollar. Further support for the dollar came when news broke about the growing possibility that US quantitative easing might end during 2013. The daily EUR/USD chart has now given two big bearish candlestick signals and this morning the pair has fallen again to $1.3020. The euro/dollar pair initially opened around 100 points higher at $1.3293 yesterday, following the US budget deal agreed after a long stalemate. But after averting the so called fiscal cliff, the next question is 'what now?' This reduced the initial enthusiasm, especially when the debate on spending cuts was left for another day. In the end the euro lost 108 points for the day to $1.3185 and is still under pressure this early morning, trading at $1.3150 at the time of writing. It seems that the repeated failures at the $1.3300 level have brought out a few single currency bears who are looking to cap gains. In the FX spread trading markets, this morning's risk-on move is to the detriment of the US dollar, with the riskier currencies pushing higher across the board. The euro-dollar pair is currently trading at $1.3280 and this brings into focus the resistance levels seen around $1.3310, $1.3365 and $1.3415. To the downside, support is seen at $1.3245, $1.3200 and $1.3170.